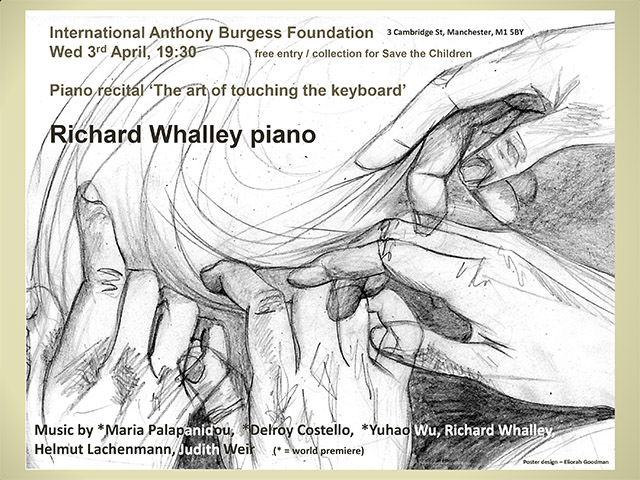 Richard Whalley is a composer and pianist living in Manchester, where he is a Senior Lecturer in Composition at the University of Manchester. He studied at the University of York with Roger Marsh and Nicola Lefanu, then at Harvard University for a PhD in Composition with Mario Davidovsky and Joshua Fineberg. As a pianist he has premiered a number of new works by himself and numerous other composers, including Camden Reeves, Kevin Malone, Tom Coult and Peter Swinnen. He teaches regularly on the composition masterclass at the ARAM-Poitou Summer School in France, where he is a regular contributor to the Concerts en nos Villages series. As a composer he was finalist in BBC Young Musician of the Year 1992 and Gaudeamus 2001, and more recently his music has been performed in the ISCM World Music Days in Flanders in 2012 and Milan Expo in 2015. His music has been performed in the US and throughout Europe by numerous outstanding soloists and ensembles, and in 2016 his work Misplaced Time Refound for solo flute was shortlisted for a BASCA British Composer Award. His scores are published by Composers Edition and you can find information about CD recordings of his music at richardwhalley.com. There will be a collection for the Save the Children Yemen Crisis Appeal – donate in advance here.